We are skilled, experienced specialists when it comes to treating vascular or venous disorders. Our outpatient special practice for phlebology and vascular surgery in the center of Augsburg has served patients since 1994. Dr. med. Tsantilas, our senior medical doctor, is known as one of Germany’s most experienced physicians in the field of vascular medicine, with a record of excellence in both diagnostics and treatment. Together with his team of highly qualified physicians and medical assistants, Dr. Tsantilas treats all forms of venous and arterial disorders as well as diseases of the lymphatic system at the highest medical level. Our special practice provides both outpatient and inpatient services. We care deeply about our patients. As often as possible, therefore, we use gentle procedures and minimally invasive methods of treatment tailored to the individual needs of the patient. 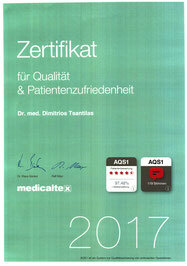 To meet the most demanding medical standards at all times, we constantly refine our internal quality management system. Our goal is to ensure the best medical treatment and care for our patients. To achieve that goal, we are committed to providing our medical staff with continuous training and engaging in friendly and respectful communications with our patients.